The Coral Triangle got a translation! It is now available in Dutch! If you need to fill out your collection, be sure to get this hot-off-the-press edition! My PhD research is a year behind schedule. The process of getting my research permit and subsequent visa was supposed to take 4-6 months. It eventually took 14 months and left me with a very short period to complete my field data collection. I have now finished two data collection trips to Malaysia and am now back in Kyoto processing the data and getting ready to analyze, write, and publish. Over the course of the two trips I conducted 59 interviews, interviewed 75 respondents, taking 34 hours and 14 minutes. Interviews were conducted in Kuala Lumpur, Putrajaya, Kota Kinabalu, Kudat and Semporna. 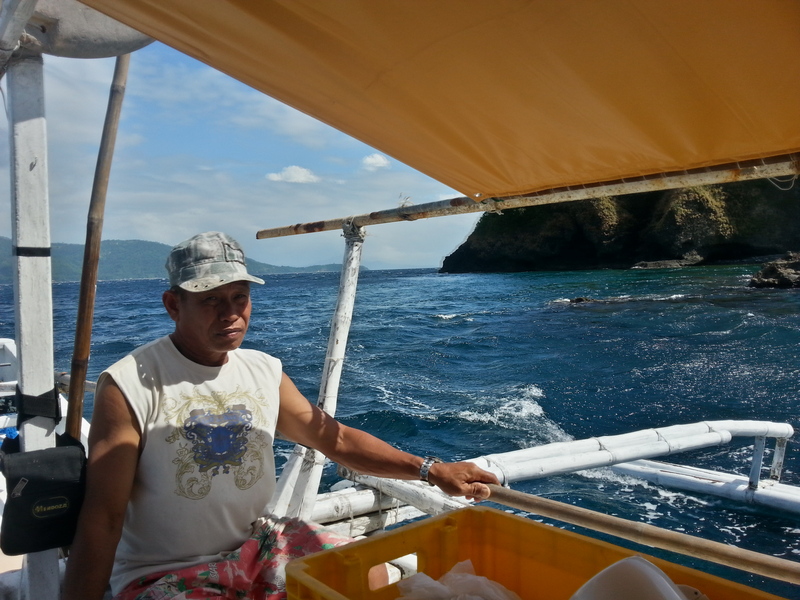 I interviewed government officers, consultants, NGO representatives, and fishermen. During the second trip, I had the help of a great research assistant, Lau Chai Ming, who assisted with translations and scheduling of appointments. 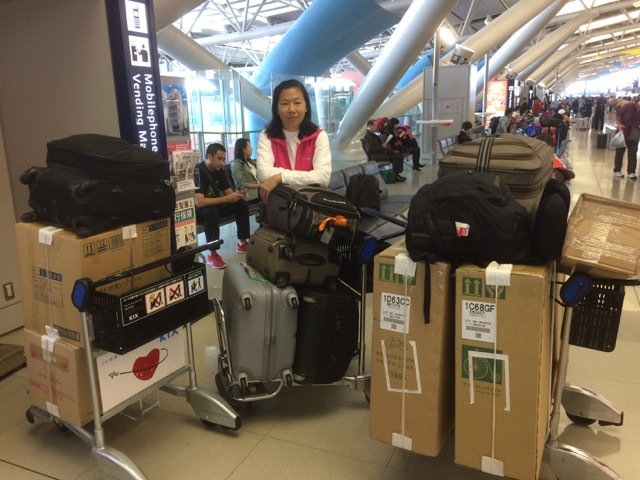 Chai Ming – My research assistant for the second trip. Was really lucky to find such a great assistant. We hung out around fishing jetties in Kudat and Semporna and met with fish traders and fishing boat owners. Trawlers are common in Kudat. They drag a net behind them along the bottom of the sea and scoop up anything that is living along the bottom. Its a pretty destructive form of fishing. We also got to visit Pulau Banggi and see the great work of the Banggi Youth Club. The Youth Club conducts awareness activities with local communities and works closely with WWF. Some members of Banggi Youth Club. In Semporna we observed the Mabul tuna landing. Fishermen use small boats to spend 2 to 3 days at sea and pull up tuna with just a line and a hook. Without any other equipment they can land tunas that weigh up to 70 kg. The ones we watched them land were in the 20 to 30 kg size. 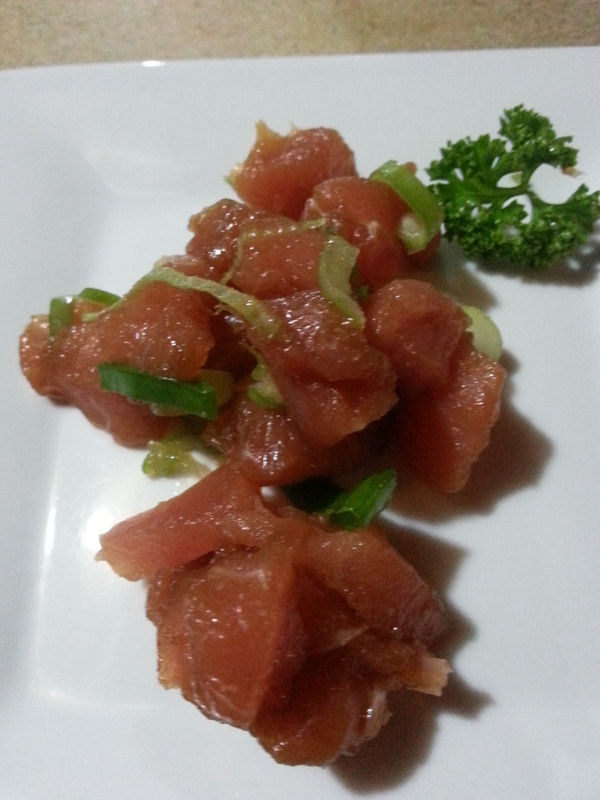 Yellowfin tunas from Mabul Island. These are destined for a cannery in the Philippines. We were even lucky enough to get invited onto a purse seine boat during a trip out in Semporna. Unfortunately, there was a full moon the week we were in Semporna so the purse seiners were not able to fish very much. They spent most of the week at the jetty doing repairs and mending nets. On our last night we got invited out. Here’s a short video of one of the exciting parts – little fish jumping in green light. The lights are left on for several house to attract the fishes. Yakin – the purse seiner that we got to follow. What an amazing experience. I want to spend more time on this boat! On Friday I have to give a progress presentation for my PhD. I could give the presentation in one slide, but I won’t. That slide would say: “Bit off too much. Research permit took 18 months. Not much progress.” So, what have been doing since May last year, when I last seriously thought about my PhD? I have completed several consultancies including a major edit of Malaysia’s State of the Coral Triangle Report, completed a final report for Malaysia’s USAID Coral Triangle Support Partnership Programme, proof-read a book about ecological connectivity, published 5 articles in Action Asia magazine (with Eric Madeja), traveled to USA, France, Japan, Malaysia, Indonesia, Timor Leste, Papua New Guinea, Solomon Islands and one day in Australia. And, this week, finally, submitted the last of the major products for the Coral Triangle book. And now I need to get to writing a progress report. And then…. a PhD. And then….. I first met a Solomon Islander in Fiji in 2000. We were at a WWF workshop together and had a nice long chat over sunset drinks. I had no clue about the Solomon Islands back then and had no idea what kind of horrible events were unfolding in his country at the time. They were experiencing ethnic tensions between natives from two islands clashing over land in the capital. By the time I met some more people from the Solomons, a few years later, I knew a bit more about the place and it captured my imagination. But it took me another 12 years before I finally got there. Eric and I arrived in Honiara on a sunny morning. The flight from Brisbane had offered spectacular views of the Coral Sea and some of its islets, reefs, and wide expanse of blue water. 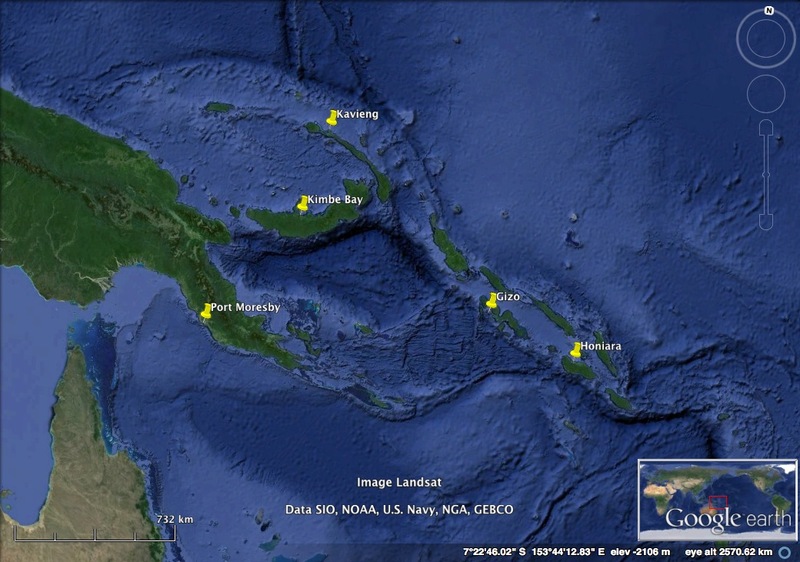 The first glimpse of the Solomon Islands was Bellona Island, just north of the World Heritage Rennell and Indispensible Reefs. We were then treated to a cloudless flight over the width of Guadalcanal – replete with unbroken rainforests. The single immigration officer, without the benefit of a computer, for a plane load of visitors was the first clue to the poor state of the country. The second clue came when neither of our phones could connect to a local network – as we waited our turn at the immigration desk. But the officer was friendly and greeted us with a warm welcome and a betel nut-stained smile – the first of many to come in the Solomon Islands. Honiara greeted us with a traffic jam. The single roundabout at the entrance to town causes a perpetual back up along the main road. It gave us a welcome chance to chat with our fellow van passenger. The young Australian was in Honiara to present an Environmental Impact Assessment report to the Department of Environment for his company’s plan to install a geothermal power plant and provide power to Honiara. 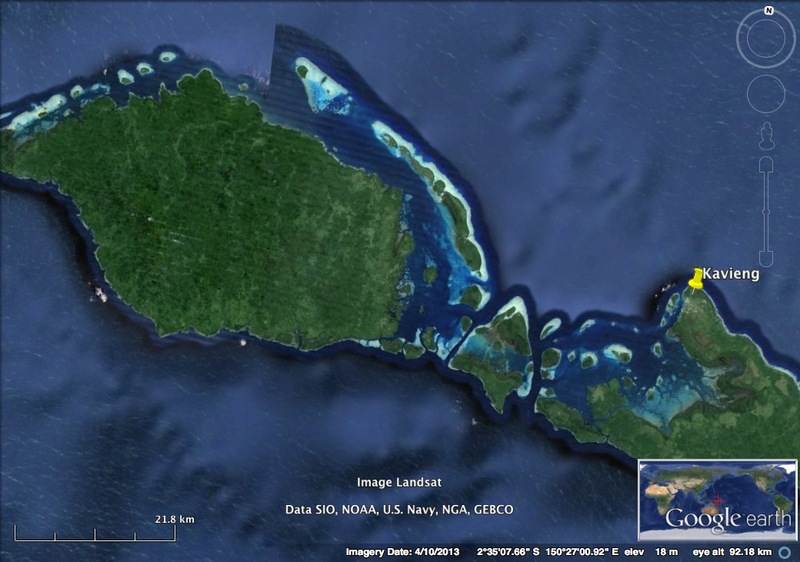 The project would provide Solomon Islands with its first home-produced power. Currently all the electricity in the country comes from diesel driven generators, but that is just for the lucky areas that have electricity. Many islands and villages lack any power. We had booked a room at the Chester Rest House. It turned out to be run by the Melanesian Chester Mission and staffed by the brothers of the order. We were very happy to find it welcoming and very clean. The high points were the immaculate shower and the long verandah offering views of Honiara and Iron Bottom Sound – the site of one of WWII’s legendary naval battles. Otherwise, Honiara did not have much to offer. The lovely verandah of the Chester. We visited a few local markets and found the “smashed tuna” for sale disturbing. The massive American, Taiwanese and Japanese tuna boats sell the badly damaged fish to locals. The broken jaws and swollen bodies looked horrifying and were apparently illegal to sell locally but commonly found in the markets. 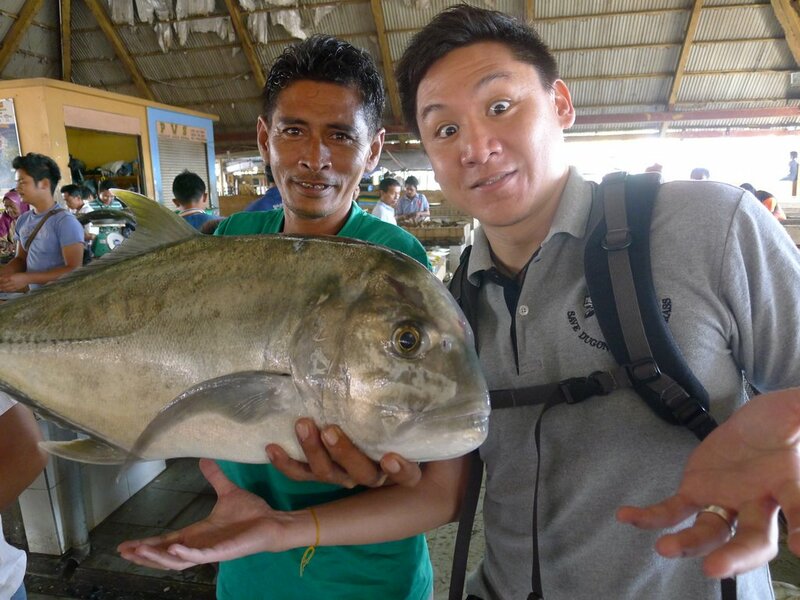 It was fun to find other fish including huge mangrove mud crabs and a Mola mola head. 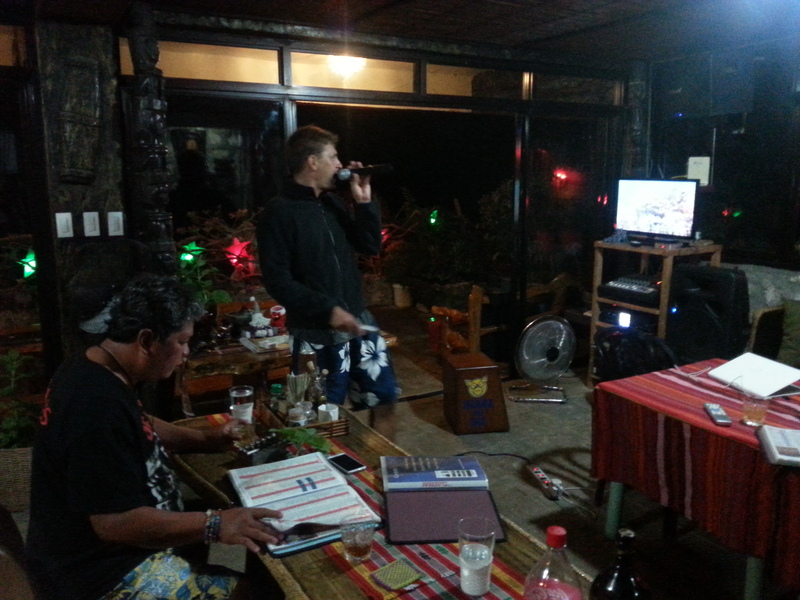 We managed to get in a few interviews, made ourselves some dinner in the Chester kitchen and prepared for our next flight to Gizo – Solomon Islands’ second city and the capital of Western Province. We were scheduled for 7 days in Gizo with complimentary diving from Dive Gizo and a few days looking for spawning groupers with WWF. The Dash-8 flight to Gizo traveled low and offered spectacular views of forested islands, blue waters, azure reefs and deep lagoons. It was thrilling. Until the rain came and the pilot announced some strong winds in Gizo. The final approach into Gizo, towards the narrow runway built on top of a reef, through the driving rain, involved an impossibly steep turn and quick drop onto the tarmac. We had to dash from the plane to the tiny building that makes up the terminal building. After waiting for the next passengers to board and the plane to take off again, we walked across the runway to a little beach where several boats waited to ferry us to the main island. The rain didn’t stop for 5 days. Eric dove for two days in the rain but gave up after a few days. I stayed in town and tried to get as much information and writing done as I could but the rain really prevented us from doing much. 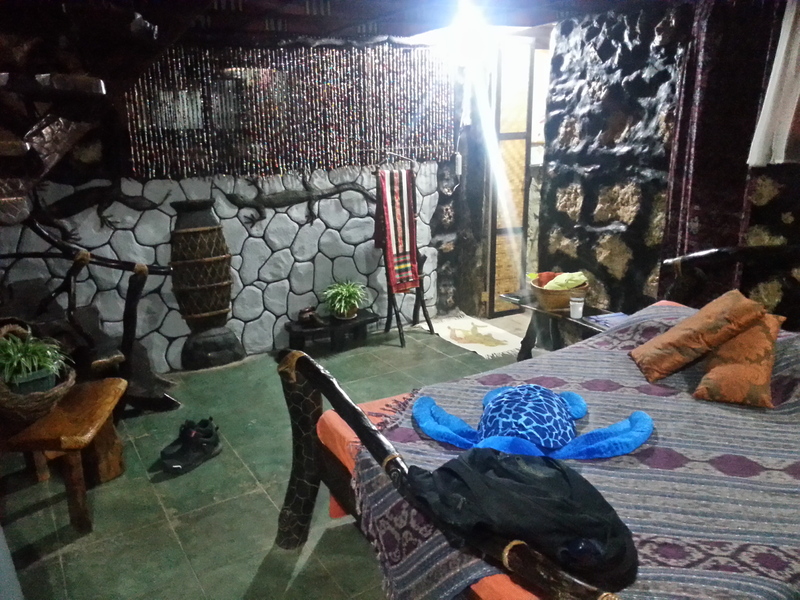 Our rest house was not as clean and nice as the Chester and we seriously considered moving. We overcame the issue of not having running water but the bath rooms weren’t clean and the mattresses smelled musty. It didn’t help that the place filled up with other people who were stranded in Gizo while waiting for the weather to clear enough for them to catch a tiny boat back to their home island. Gizo may be the Solomons’ second city but you wouldn’t guess it if you didn’t already know. There is only one paved road and it is less than 1 kilometer long. The nicest building is the brand new, Japanese-donated, hospital. The current construction boom may have 5 or 6 buildings going up, but only one of them has a crane to help ease the process. The new buildings may be part of the process to rebuild after the devastating 8.1 earthquake and resulting tsunami in 2007. Eric and I managed to get a few days of diving with less rain but the conditions were less than ideal. Every day was cloudy and the water was too turbid for good photos. To make matters worse, we had not expected the devastation of the corals from the earthquake. Some areas looked like a war zone – but the fish life was intact and some sites had more fish than I had seen anywhere else. With only 550,000 people in the whole country, the chances of overfishing are much lower than in Southeast Asia but people are still worried about the effects. Our final two days in Gizo were sunny and fine weather. We managed to squeeze in a few more dives and some photo ops. The flight back to Honiara offered spectacular views of Morovo Lagoon, the world’s largest marine lagoon with a double barrier reef system. Unfortunately, they say that the logging on the islands within the lagoon has spoiled much of the reefs but the outer reefs should still be okay. And after one last night at the Chester, we bit farewell to Solomon Islands, but I hope to get back for a longer stay some day. The writing for the Coral Triangle book is coming along pretty well, but I wish it were moving faster. I have cleared almost all my other professional side projects and am now down to just this last big one. 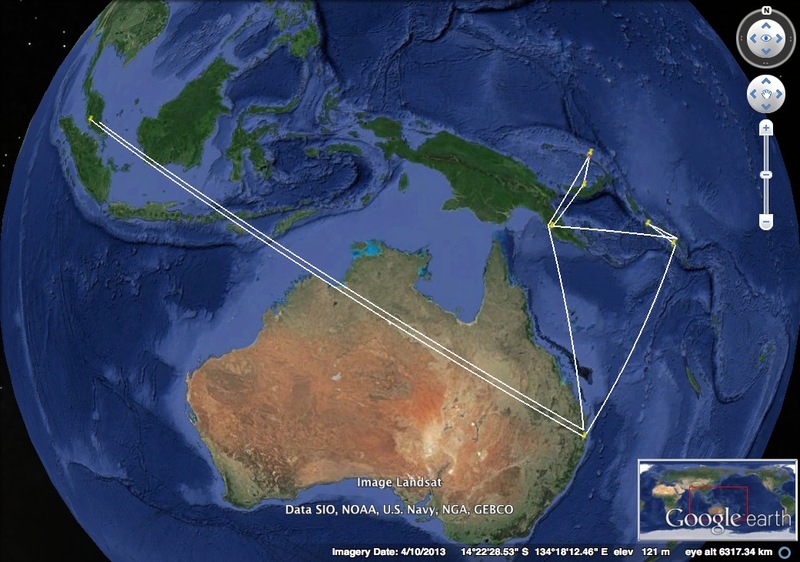 To wrap it up, Eric and I will be making a marathon push to Melanesia later this month. In total we will take 13 flights, over 12,000 miles and visit 3 major field sites in Papua New Guinea and Solomon Islands. 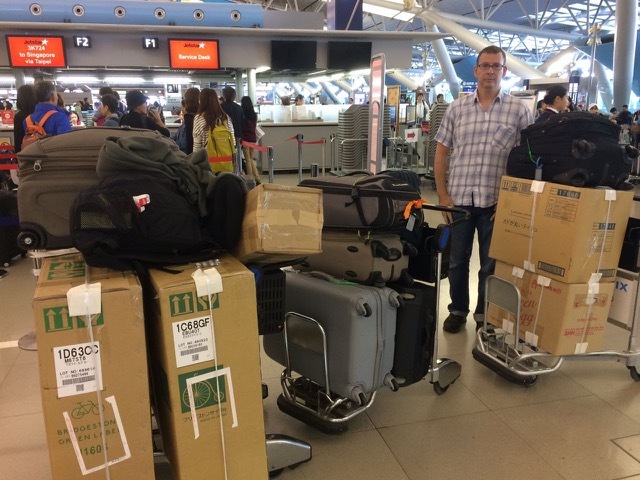 Flights from KL, to Brisbane, to Honiara, to Gizo, to Honiara, to Port Moresby, to Lae, to Kimbe Bay, to Rabaul, to Kavieng, to Port Moresby, to Brisbane and back to KL. 20,000 km. We will make longer stops in Gizo, Kimbe Bay and Kavieng. 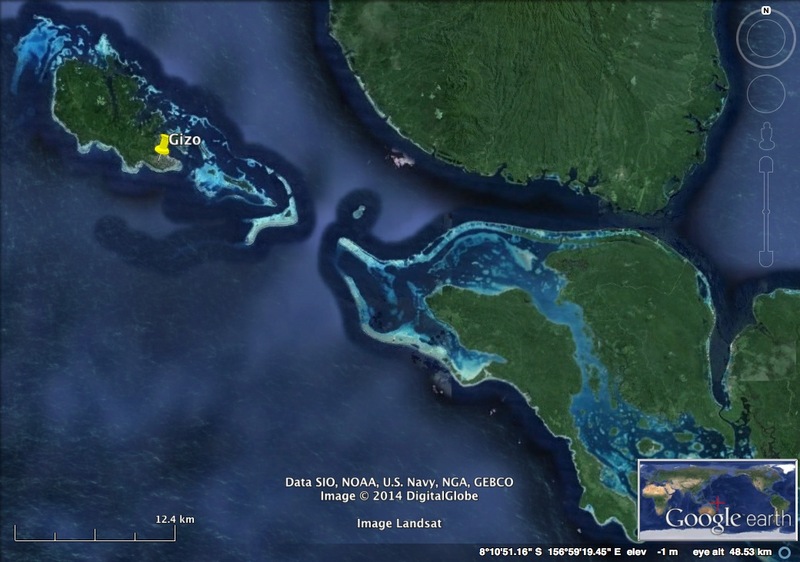 We will be visiting WWF projects in Solomon Islands, particularly around Gizo Island. 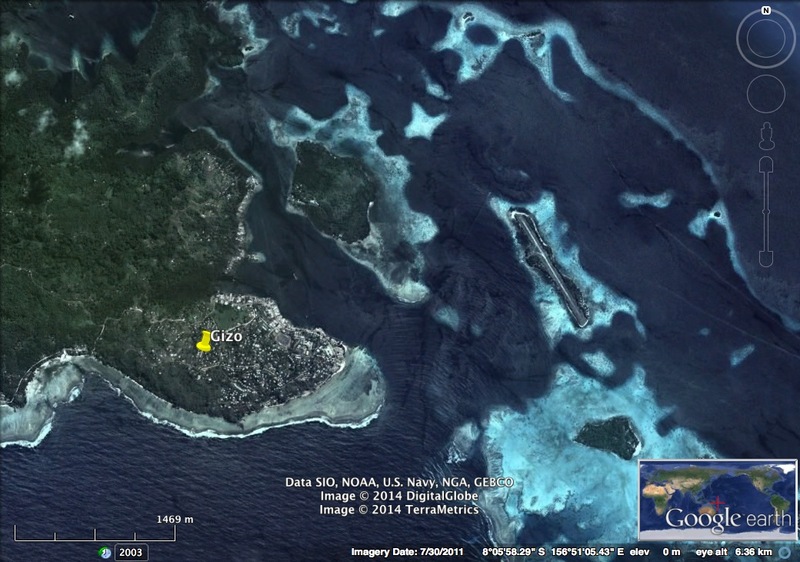 I have wanted to visit Gizo since 2002 and thought I might never get the chance. Hopefully the reefs are as stunning as they were described to me 10 years ago. Check out the location of the airport! Air strip? Air coral reef? How do you get to the airport??? 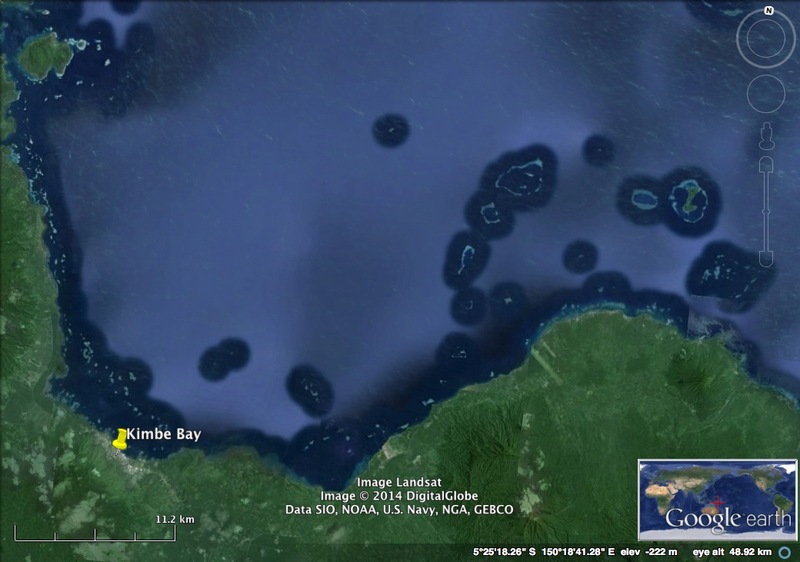 In PNG we will visit Kimbe Bay, where The Nature Conservancy worked for many years to establish a network of marine protected areas. 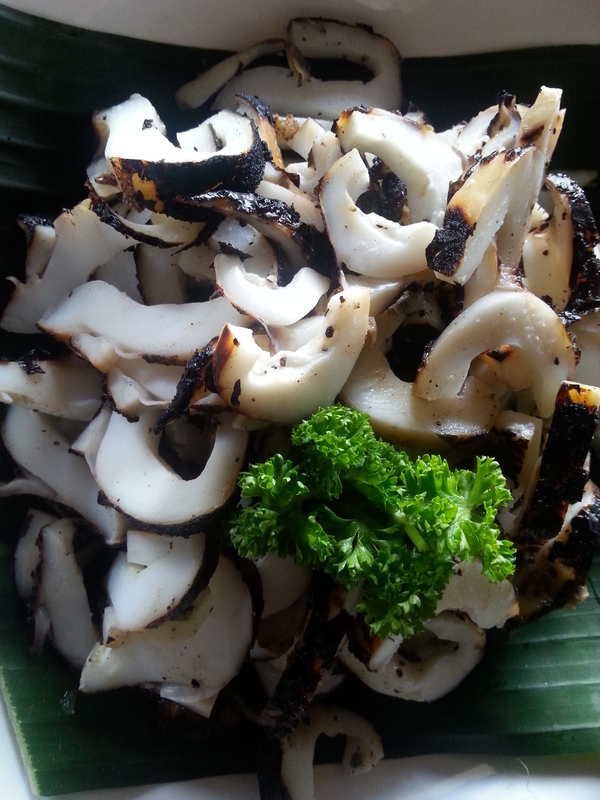 We’ll visit a local NGO, an oil palm plantation and a dive resort. Kimbe Bay. The deep waters are home to Sperm whales. Our last stop will be at Kavieng. I visited this place in 2002 on a side trip during a workshop. The diving opens up to the Pacific Ocean and the chances to see really big fish is high. We’ll visit the Wildlife Conservation Society and the National Aquaculture Research Centre. Kavieng is at the western tip of New Ireland island. We’ll be thanking many partners along the way, but so far we have great support from WWF-Solomon Islands, WCS Papua New Guinea, New Britain Palm Oil Company, The PNG National Aquaculture Research Centre, Walindi Resort and Lissenung Island Resort. We depart on 17 February and return to KL on 21 March. Whew! And for those who have asked….. the currently erupting volcano in Indonesia is 5,600 km away at its nearest. I am closer in KL than I will be on that trip. 🙂 So no worries. Manila is a mega-city with dirty streets, traffic jams and bad air. Just 2 hours south is a coastal paradise. The municipalities of Mabini and Tingloy are commonly, if erroneously, known as Anilao. 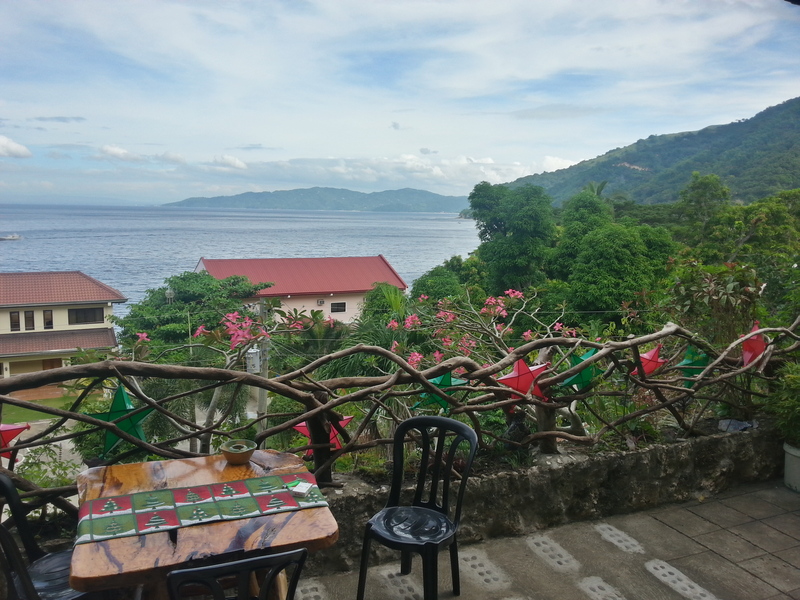 Anilao is the diving back yard of Manilanos who want a quick weekend diving trip. 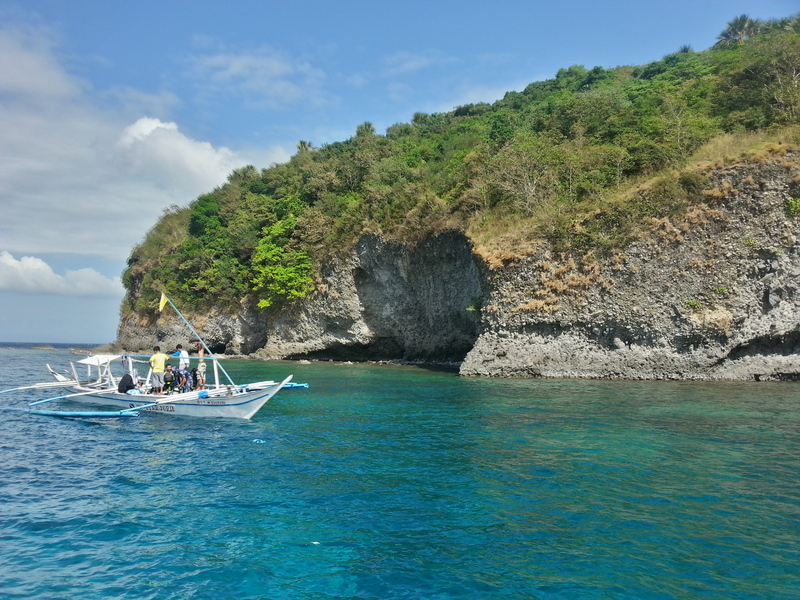 Anilao, once a haven of dynamite and cyanide fishing has turned around to become a world class diving destination, but nestled in the hills above Cathedral dive site is the hidden gem of Bontoc in Batangas. The view from the main deck. Guest room. With a loft above for 4 additional beds. 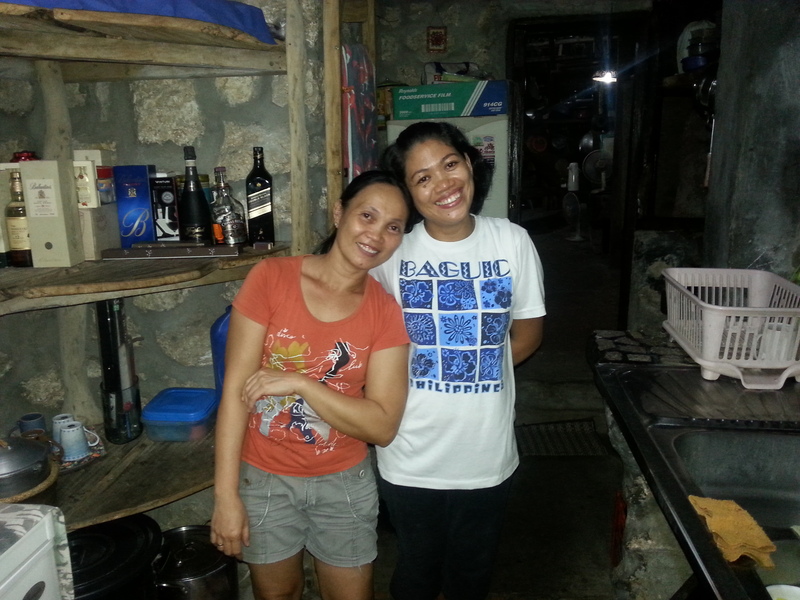 Bontoc in Batangas is the home and guesthouse of Romy and Anne Trono. They built the house as a weekend getaway for them and their three children but as the kids grew up, the place has slowly turned into a side business for them to welcome friends who come for Anne’s gourmet cooking, Romy’s bonhomie, the diving, and the general relaxed atmosphere of the place. 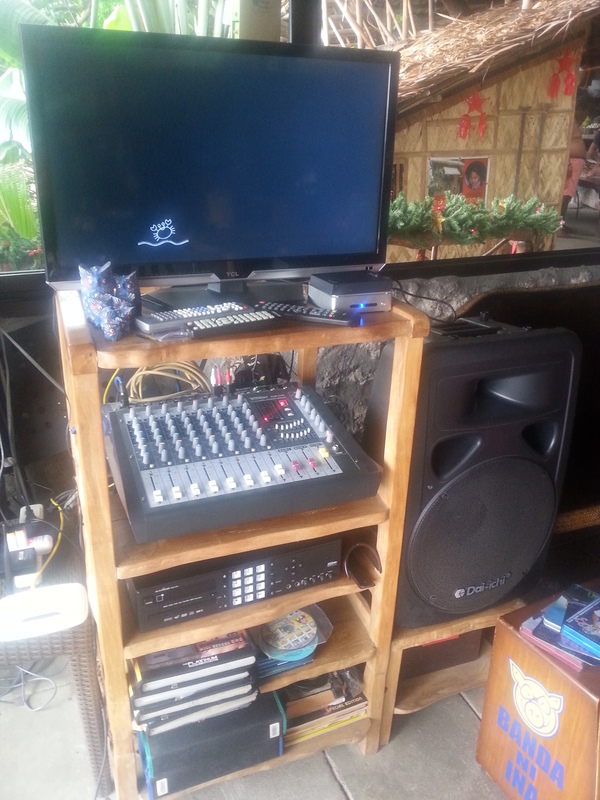 The music system is high tech! Jo and Lisa always ready with a glass of water or rum! Cannot stay with Romy without singing a few songs. 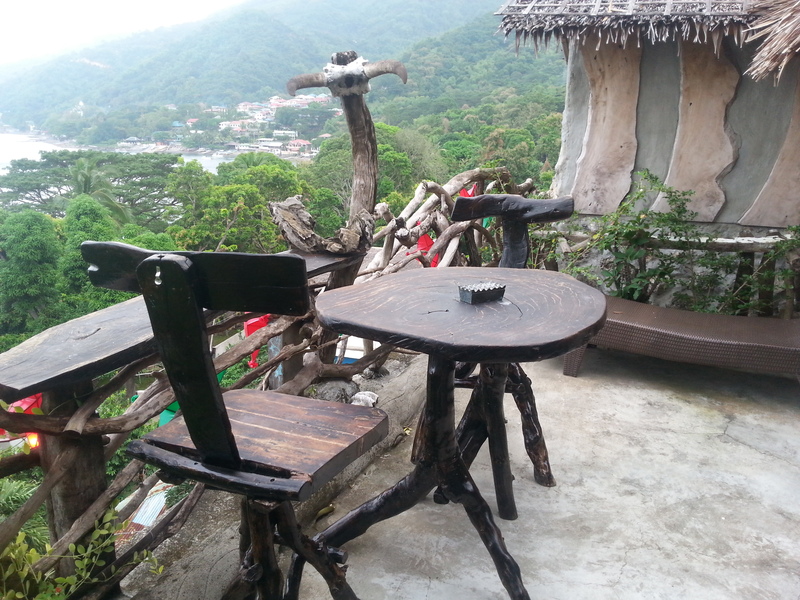 At Bontoc in Batangas you will never be without a drink in your hand. The staff always have a glass of ice water, coffee, or rum and coke ready. The rate includes all you can drink and three buffet meals a day. 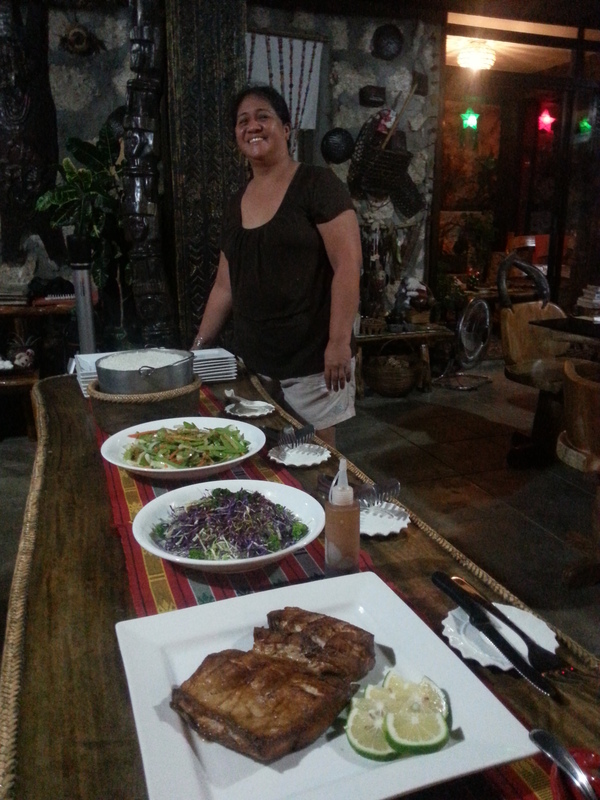 The meals are presided over by Anne and their chef daughter Abby and always include several traditional Filipino dishes – fish, vegetables and pork. When we arrived for our 4 night stay at Bontoc to collect stories for our book project, Romy told us that we were not allowed to leave unless we gained 2-4 pounds. Fortunately, they didn’t weigh us at check in. Eric, who is used to one maggi noodle per day, was worried about eating too much. He had no idea what was in store……. Fresh yellowfin tuna sashimi. Wow! 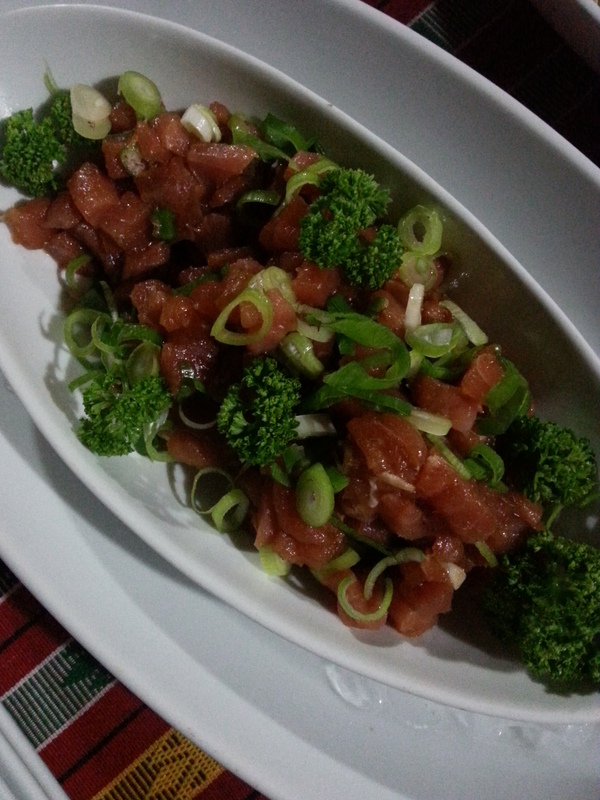 Raw tuna salad with sesame oil. Like eating raw butter but better! 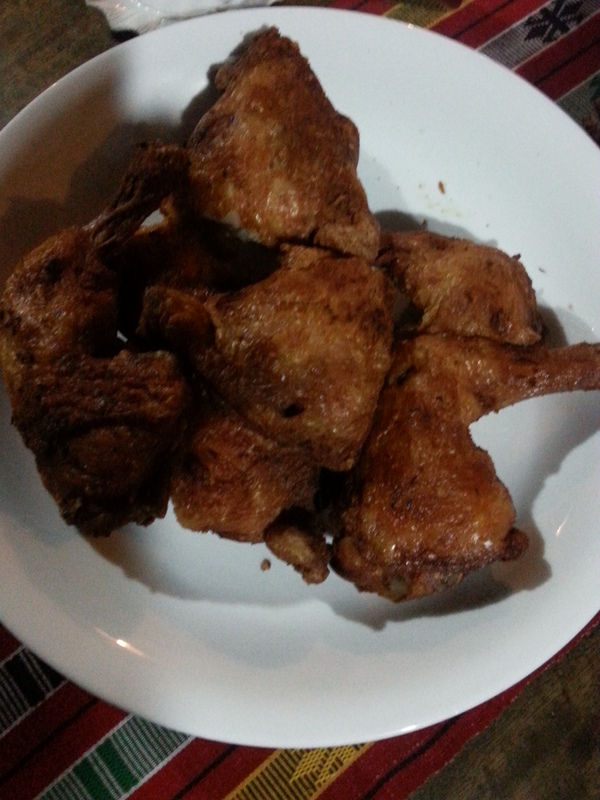 Fried chicken with lime leaves. 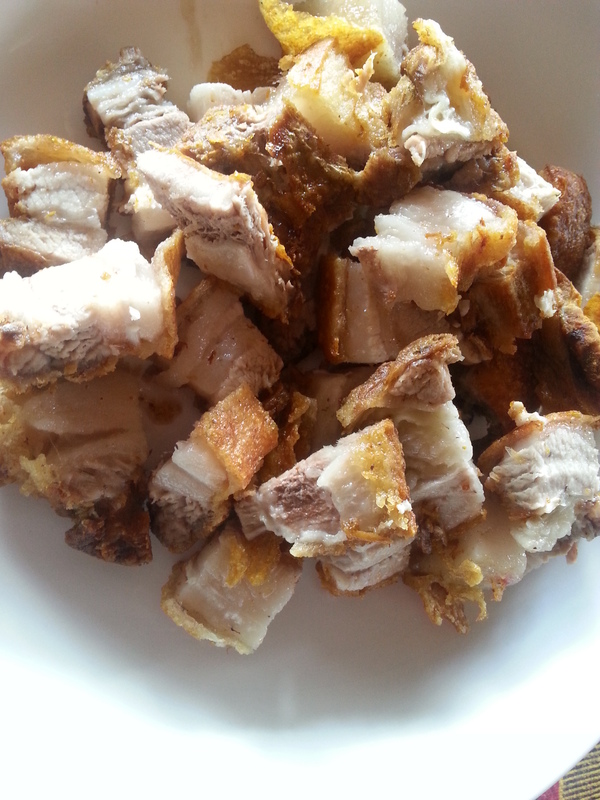 Masarap! Sedap! Delicious! 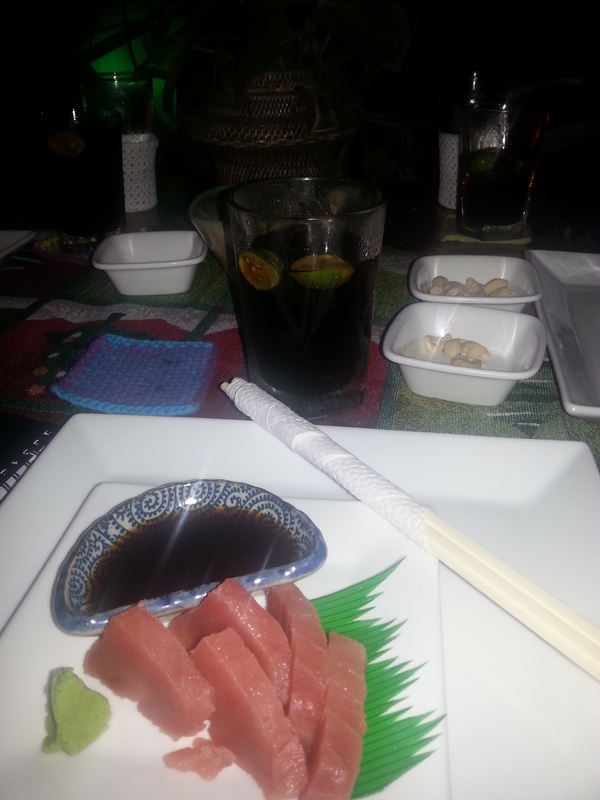 Raw tuna marinated in sesame oil, onions and chili. 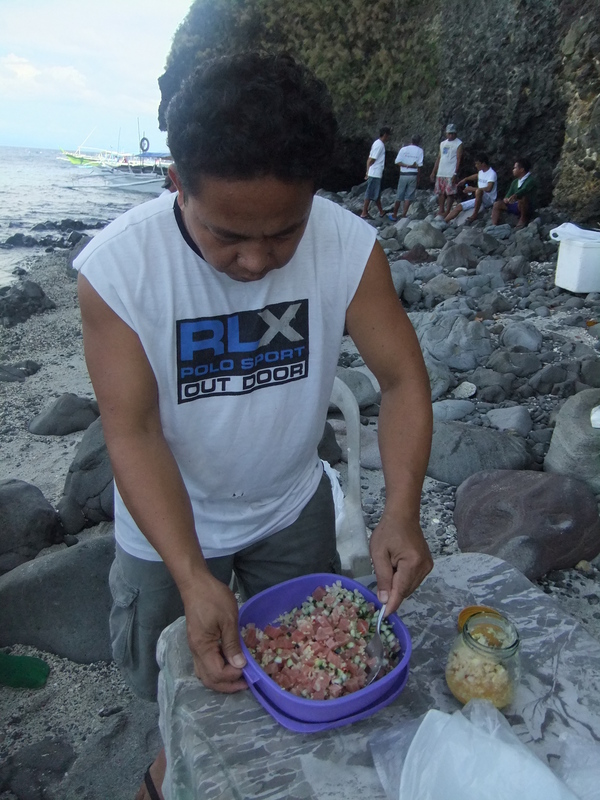 Mixing raw tuna for kinilaw on a beach in Anilao. Anne is a gourmet cook. Her meals use simple local ingredients and recipes but she makes them with care and love that shines through in the simplest of dishes. Every meal is a journey through the Philippines archipelago and usually features a gorgeous fish, some pork and some vegetables. 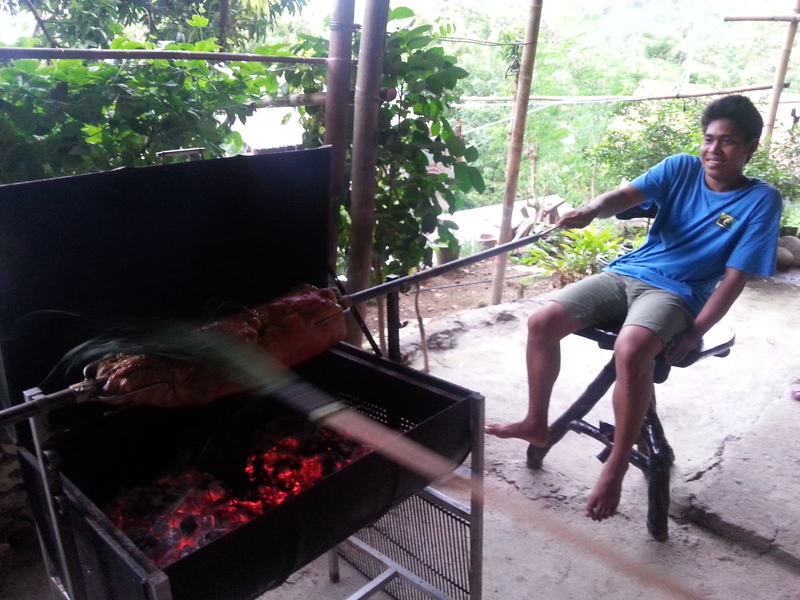 One of Bontoc’s specialties is Filipino-style Balinese “babi guling.” The herb stuffed, slow roasted pork is to die for! 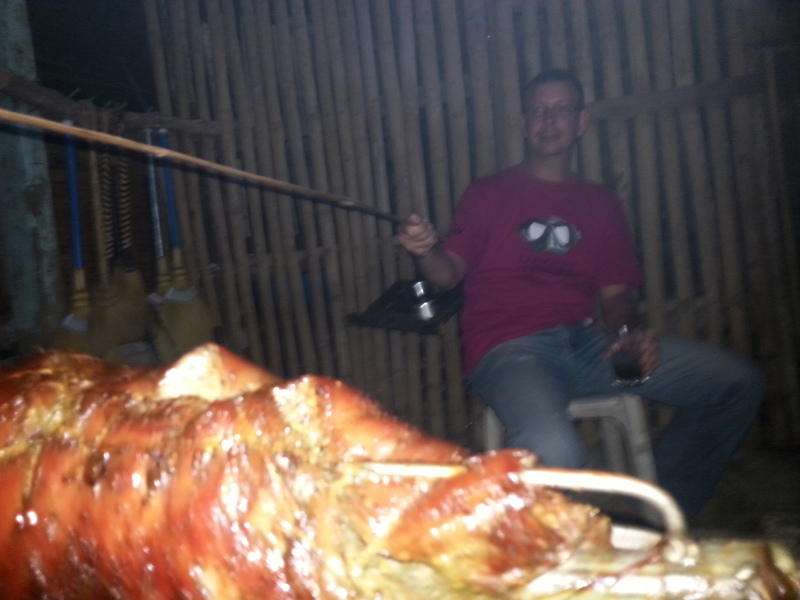 For people who don’t take pork, Bontoc will gladly serve fish or vegetables. 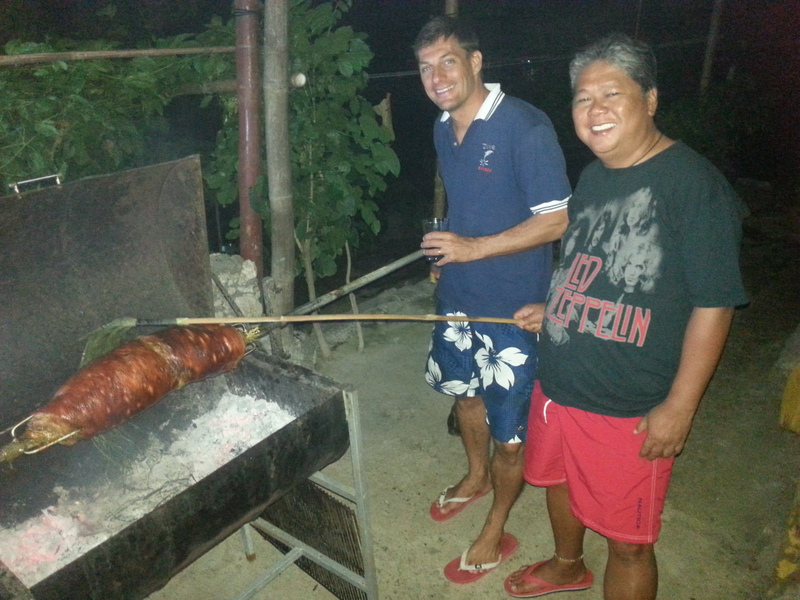 Eric and Romy tending to the Balinese pork roll. 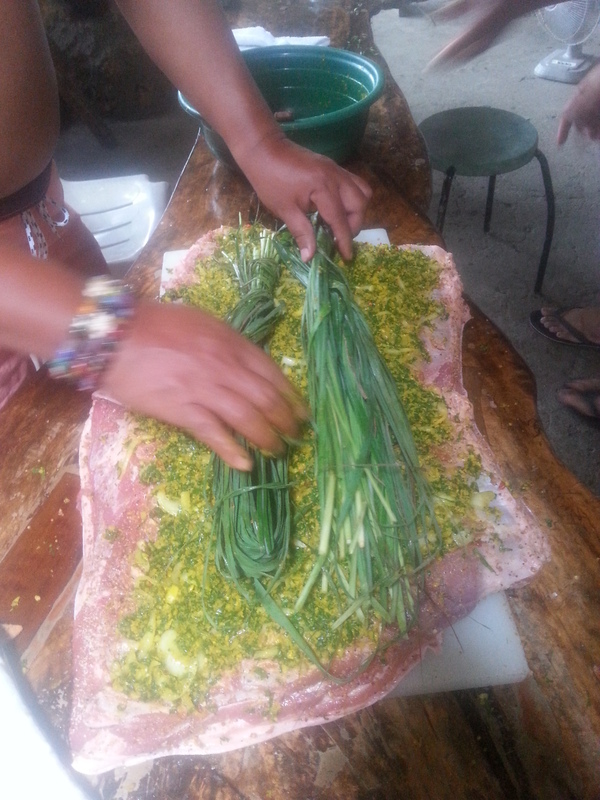 Rubbing the babi guling with spices. 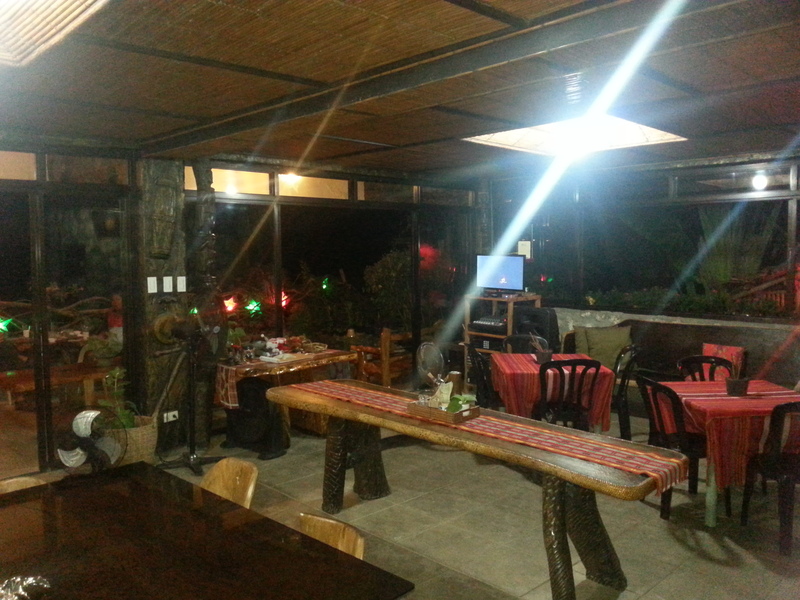 Bontoc in Batangas is a great place to spend the weekend, do some diving and enjoy the good life. Highly recommended. 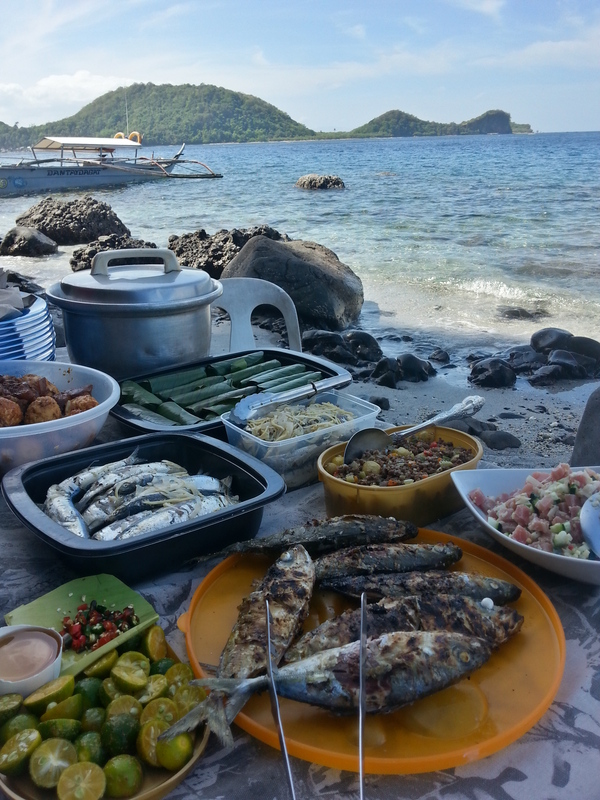 The best meal though was on the beach with fresh fish barbequed over the rocks and the rest lovingly packed from the house…. 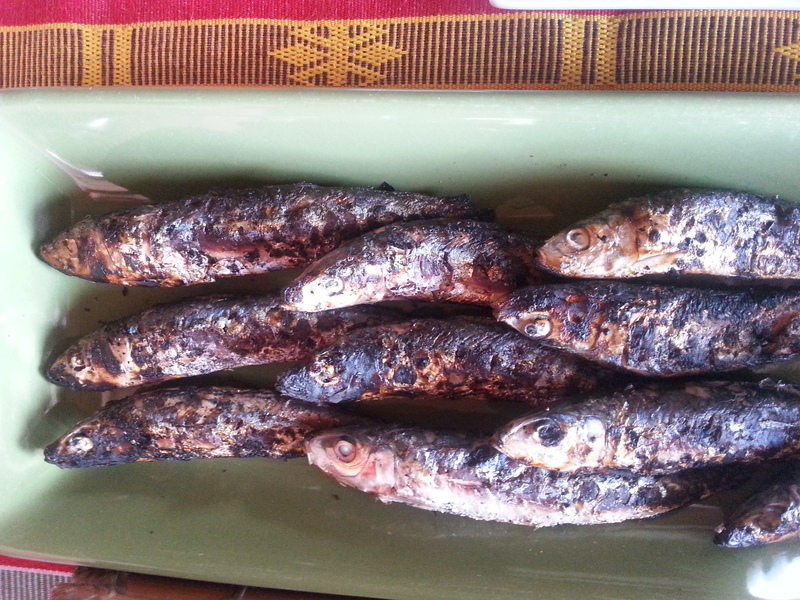 “Snacks” for our interviewees on the beach – and the most amazing meal of the year. 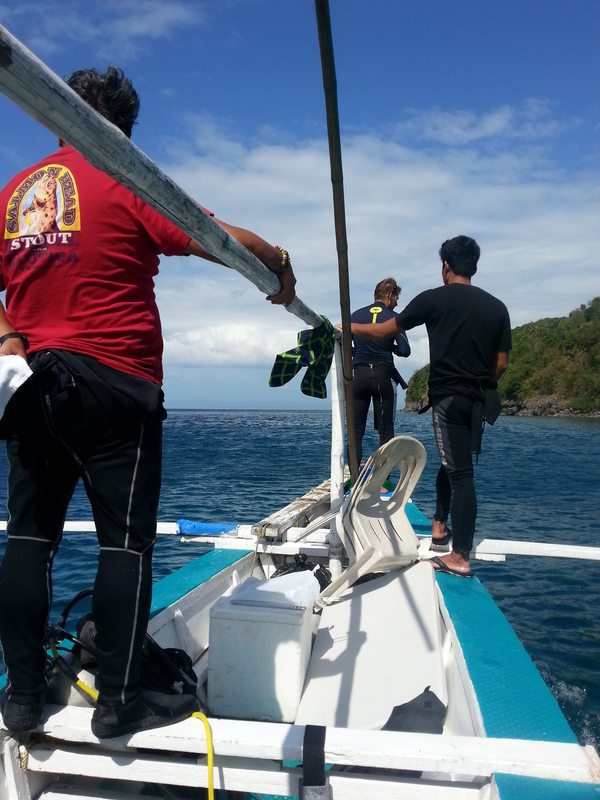 Romy guiding us to the next dive site.